One of Firle’s most evocative, and perhaps surprising, treasures is John Montresor’s manuscript map and defensive survey of New York City. An elaborate cartouche, upper left, contains the title, “Plan of the City of New York and its Environs to Greenwich on the North or Hudsons River and to Crown Point on the Sound or East River”, it is undated but was completed in January 1766. At the lower left corner of the map is a ‘redcoat’ soldier guarding a flag: the text on the flag gives an indication who was ultimately responsible for the creation of this historic document: “To his Exc. Tho. Gage Esq. Major Genl. & Comm. in chief of his Majestys Forces in N. America…“. This original manuscript map, which has remained in the Gage family for the past 250 years, stands as an eloquent memorial to General Thomas Gage – one of the most fascinating figures in the storied Gage family. More immediately, it also recalls the turbulent and uncertain New York winter of 1765-1766 – a time when the American Colonies very nearly erupted into open rebellion. The hushed and tranquil atmosphere of Firle Place could not be further from the chaotic streets of New York City in the autumn of 1765. Outraged by the increased taxes brought on by the recently-passed Stamp Act, the Sons of Liberty took to rioting in the streets on a near-daily basis. General Thomas Gage, then the most powerful military leader in the colonies, recognized the gravity of the situation and on December 16th ordered his most gifted engineer, John Montresor, to survey and draw a map of the area which would include all features pertinent to military maneuvers. Not only did the map need to be completed quickly, it would have to be done carefully to avoid detection. Both men knew that if the rioters learned of the scheme (and of General Gage’s intended use for the map), there was a very real possibility that Montresor would be set upon by an angry mob. Viewed against this dramatic backdrop, the finished or ‘fair draft’ map, which was presented to General Gage on March 11, 1766, is a fascinating historical document not only because of what Montresor included but also because of what he omitted. Main thoroughfares, fortifications and hilly terrain are shown while most street names, property boundaries and pertinent municipal buildings are virtually ignored. The map makes it clear that General Gage’s instructions were well understood–Montresor included only information relevant to military operations. As a result, this spare-yet-elegant map is a true testament to the turbulent times from which it was born. In early 1766, with revolt in the air throughout the colonies, the British Parliament reopened debate on the Stamp Act and eventually passed a resolution to repeal it, which was signed by King George III on March 17, 1766 (although official word did not reach New York until May). Having achieved their goal, the rabble rousers quieted down and the tension in the city subsided. Thus, General Gage had no need to resort to military force and the map was stored away for future use. John Montresor, taking a well-deserved leave of absence from the army after the brutal challenges of the previous winter, set sail for England in October 1766. Tucked inside his trunk was his own hand-drawn copy of the ‘fair draft’ map that he had presented to General Gage. This second manuscript map, which was engraved by P. Andrews in London in April 1767, was subsequently lost. But the engraving that Montresor oversaw became the first in the so-called Montresor-Ratzer-Sauthier sequence of engraved maps of New York City. This sequence resulted in the best cartographic representations of mid to late 18th-century New York City and its environs. 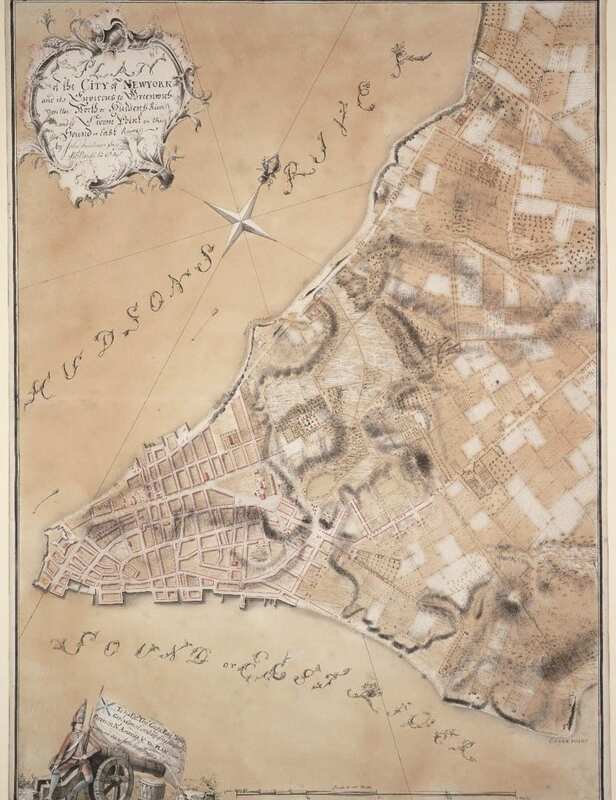 It was added to by surveyors Bernard Ratzer and Claude Joseph Sauthier, whose maps appeared in c.1770 and 1776 respectively. So, whilst the Montresor engraved published map marks the start of the published sequence, it is the Montresor manuscript survey, commissioned by General Gage, which remains the progenitor.